The 6.0L from Chevy means business. The near 400 horsepower makes this crate engine an in demand engine for those that seek out more power. 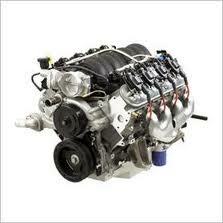 Our Chevy 6.0L crate engines for sale are built by professionals that know what our customers want. The great thing about this LS2 engine is that is fits well into many Chevrolet vehicles. The Corvette, GTO, Trailblazer, Cadillac and Saab are just some of the versions where this high torque engine fits the bill. If you are searching for a new 6.0L LS2 engine, you have found the right place. Our expert mechanics know how to give you true GM performance power at a less than MSRP price. There are many crate engines in our inventory that are Chevrolet. We choose to specialize in this brand of automaker engines because we trust the Chevy name. We hire the best mechanics that know everything to possibly know about these engines. Our engine builds are error-free and follow Chevy guidelines closely. We never hurt the original power of these engines by anything that we do during the rebuild. We give you an exact replication of what you can find sold at any Chevrolet dealership. Our crate engines from Chevy are meticulously built and offered at the low price that you expect. What Comes with our 6.0L LS2 Chevy Engines? We don’t sell you an empty block like some dealers will. Each LS2 engine is built by hand in our crate engine facility. At any given time, we are building 6.0L engines to make them available for sale. These are complete engines that are ready to be put into your choice of Chevrolet vehicle. These engines are not missing essential parts that should be found on a complete crate engine. Our Chevy 6.0L crate engines for sale are tested before we ship one out to you. This eliminates the possibility of you getting an engine with an error. The last thing that you want is to have a sudden problem after you drop a 6.0L in your vehicle. We also warranty our labor and OEM parts that we provide. Each OEM part has a certain amount of warranty coverage attached to it. We feel that these parts should live up to their expected life cycle and we make sure they do. We give you a 3-year warranty on what you buy. This ensures that you never have a problem that goes undiagnosed or repaired. Our Chevy mechanics put many hours of expert time and passion into each crate engine that is built. We ship our LS2 engine very fast and never make you wait more than a few business days for our engines to arrive. Don’t wait to call us. We pay for your toll free call. It’s easy to get our low price fast. Our Chevrolet engine experts are the ones that assist you and not an intern. If you want your quote to be delivered by email, take the time to complete our quote form. Our Chevy crate engines low price is sent just as fast as calling us. We want you to be satisfied with our engines and will answer all of your questions prior to sale.